Stuart - Thank you for your time talking with me this evening. I will be sending my material this week for your company to process. Your courtesy and pleasant attitude made me feel comfortable asking a difficult question. I received my settlement for my silver buttons on 9/1/7...It was a pleasure doing business with you. Thank you for your integrity. That's hard to find these days. I received my settlement check last week. I was very pleased. Thank you. I also have some more precious metal scrap on the way to you. Thank you again for your service and help. A Note to tell you Thank You! We received our payment and are very happy. We do not always know what kind of metal things are made of when we sent it, so we thank you for your honesty and are ever so pleased with the amount we got. We buy and sell costume jewelry and sometimes we sort and find a little gold... Take care and we are already getting another bag together to send to you. I have done business with you in the past and will only do business with you in the future for all my precious metal refining needs. 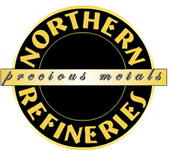 Northern Refineries is an exceptional company with superb business practices.